This day - National Day of Struggle Against Violence and Hate Crimes - was established as a reference control for the LGBT movement in Peru. Since May 31, 1989, in which a group of six members of the guerrilla group Revolutionary Movement Tupac Amaru (MRTA) shot dead eight members of the LGBT community, there have been a series of commemorative activities and complaints about these facts. On May 31, 1989 a group of six members of the guerrilla group Revolutionary Movement Tupac Amaru (MRTA) shot dead eight members of the LGBT community (mainly gay and trans), who were patrons of the bar "Las Gardenias," in human settlement "April 9, in the city of Tarapoto (San Martín). The weekly "Cambio", official organ of the MRTA, claimed the move as a subversive group's decision because the police allegedly covered "these social ills, which were used to corrupt youth." This was reported by the Commission of Truth and Reconciliation Commission (TRC) in its final report (August 28, 2003). The date has been considered by the Peruvian LGBT movement as a historical landmark. Indeed, in July 2003, and the Movement MHOL Root participated in a commemoration of the disastrous events of July 2000, when as part of "March of the Four" (which demanded a return to democracy and the rule of law) killed six workers at a branch of Banco de la Nacion. Review. At the ceremony commemorating the MHOL introduced TLGB Memory Retablo, where he realized the events that occurred on May 31, 1989, in the city of Tarapoto. In the altarpiece with the names of people who had been killed by hate gay / lesbian / transphobic from 1989 to 2003 (mostly in Lima), reaching more than 100 victims, whose stories were previously collected long working hours. By then there were ICCHRLA Special Report, with the news in the weekly Cambio, and the testimonies of some activists linked to MHOL. Public exposure of the Altar of Memory TLGB allowed members of the TRC-present at the event public-size the importance of these facts. This information was collected to be tested on the basis of data collected by the TRC testimonies, finding 3 references to those crimes, including happened on 31 May. This information enabled the Drafting Team CVR to incorporate the systematic persecution LGBT communities, and be the first time in history that a Commission of Truth joins LGBT communities as persecution and extermination. From the LGBT movement activists contributed to this process as Jorge Bracamonte (MHOL), Jose Montalvo and Manuel Herrera (Core Root Movement Sexual Diversity). Subsequently, in November 2003 as part of activities MHOL anniversary of the Sexual Diversity Collective Root (independent and Root Movement) presented an initiative to commemorate the May 31 "day of the collective memory of the crimes hatred." 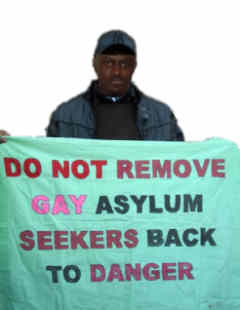 Thus the MHOL in the summer of 2004 called for a meeting of various associations and groups to discuss TLGB. The meeting took place in the building used by Lesbian Feminist Activist Group (GALFAN). There was discussed and agree on the date and the name "National Day of Struggle Against Violence and Hate Crimes Towards Lesbian, Trans, Gays and Bisexuals." 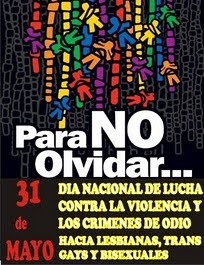 Since 2004, Lima TLGB motion to initiate the first actions to commemorate the 31 May. The MHOL organized a first conversation about the meaning of this event with the participation of one of the Commissioners of the TRC, the anthropologist Carlos Ivan Degregori. And with the collaboration for artists Susan Torres and Giuseppe Campusano underwent intervention in the Plaza San Martin with the names of those killed or missing and wreaths in his memory placed in the columns surrounding the Plaza. Likewise, groups and university centers TLGB various commemorative events organized at the Universidad Nacional Mayor de San Marcos (San Marcos), the Pontificia Universidad Catolica del Peru (PUCP) and the Universidad Nacional Federico Villarreal (UNFV). In 2005 there were a series of actions. Note the press conference developed in Congress, where for first offered the testimony of a survivor of the persecution of the MRTA and Sendero Luminoso, Peter Andrews. On this occasion, the event of intervention in the Plaza San Martín acquires the characteristics of Pilgrimage, the same from this year would be organized and convened by the set of organizations and groups TLGB Lima. The pilgrimage is a public activity that takes place from then on the streets of downtown Lima and keep the spirit of the quipu, ie, the memory of those killed by gay / lesbian / transphobia. In June of that year was held the First National LGBT, involving 115 activists from different regions of the country. Among the topics discussed are found in "Political violence, hate crimes, memory and reparation." It is in this context that the participants adopted in plenary marking the May 31 as a landmark date in their respective regions. The following year, to implement the agreement, commemorative events are conducted in some regions. In 2007, the commemoration of May 31 was coordinated by Project Experience: Art against stigma and discrimination of the Faculty of Administration and Public Health, Universidad Peruana Cayetano Heredia (UPCH) and was conducted with the participation of MHOL The Peruvian Red TLGB, Galfer and PROMSEX. The slogan used was "Homophobia Kills." In the years following the May 31 commemoration began gradually in different regions of the country, expressing a consensus on the relevance of this date nationwide. In many cases, project funds were commemorations such as the Global Fund (Fifth and Sixth Round) through Local Initiatives Fund (IDF). In other regions were promoted activities with funds generated by the / as capital / activists. Within regional experiences to gradually found / as survivors of armed conflict, especially in the regions of Loreto and San Martin. In Lima, as the LGBT Pride March, the organization of the commemoration of May 31 began to be more collective. Since 2009 the pilgrimage is organized by the so-called "Pride Collective, which brings together the majority of LGBT organizations in Lima, due to the proximity of the celebrations for International Day of LGBT Pride. It is important to recognize that in May 2008, the National Multisectoral Health (CONAMUSA) formally recognized [PDF] May 31 as National Day of Action against Violence and Hate Crimes to Lesbian, Trans, Gay, Bisexual, and initiative Peruvian Net TLGB. The MHOL believes that the May 31 date is a central landmark in our national LGBT calendar, as shows the path of movement for the recovery of memory, truth and justice. The positioning of this date and its symbolic content has been part of a long process of dialogue and tension, ultimately enriching, which started in Lima and now embodied in TLGB activism across the country. The key to the rapid extension of the date has to do with the density of events. It is increasingly visible, the need to officially declare one day related to the homo / lesbo / transphobia, especially in a context that will soon be discussed in the full House a bill on hate crimes and progressively adopting the regional anti-discrimination ordinances, including both sexual orientation and gender identity as protected categories, such as LGBT specific ordinances. We believe that May 31 should be officially recognized, either through a law (the legislature) or a Supreme Decree (Executive). His recognition of some form or another constitute a sort of symbolic reparations as part of reparation and reconciliation process, which must necessarily be visible to the LGBT population (their history, their dead, their memory, their demands, etc.) Located in the national historical context. We also believe that recognition does not only goes through the formality of a law or a decree, it is extremely important social and institutional recognition that the day is gained. The fact that the LGBT movement in different regions commemorated on 31 May is a sign of it, but have yet to reach the whole society (journalists, business through the social responsibility that is assumed by such sectors as justice , etc. ).